Have you ever opened up the Sunday paper or scrolled through Twitter and come across an event you just knew you had to attend? Maybe it involved a passion of yours or an author you've always wanted to meet. Or perhaps it offered you an opportunity to improve your skills in a field you wanted to work in. For most people, attending events is as easy as clicking a button and purchasing tickets. Mission accomplished. In an ideal world, I'd be able to do this without a second thought. But as a deaf person, I don't get anything out of attending events where there's a lot of talking unless there's an ASL interpreter front and center. It's not a luxury; it's the law. I won't bore you with the legalese, but the Americans with Disabilities Act was written with the intent to create a more level playing field for people like me. Recently, I had two very different experiences here in Chicago. One made me love the city's library system even more than I already do. The other left me disappointed with a large-scale social media conference that takes place in the city twice a year. The Chicago Public Library recently hosted Austin Kleon, an author I admire for his inspiration. Unfortunately for me, I spotted the event info three days before the talk -- and CPL requires 10 business days before an event to set up an interpreter. I knew it was a long shot, but I emailed the library's contact person anyways, just in case another deaf person had requested an interpreter. I received a reply rather quickly, but nobody else had asked for an interpreter so I was out of luck. Still, I was happy with the services and the communication. I appreciated CPL's quick response and the fact that their services are so easily accessible. I'm keeping a close eye on the event calendar from now on. However, my experience with Social Media Week Chicago was on the other end of the spectrum. I emailed them two and a half weeks before the event, asking them if they would provide an ASL interpreter if I purchased a pass. I prefer to request services in a friendly, polite way, rather than demand them -- it's just the Minnesotan in me. 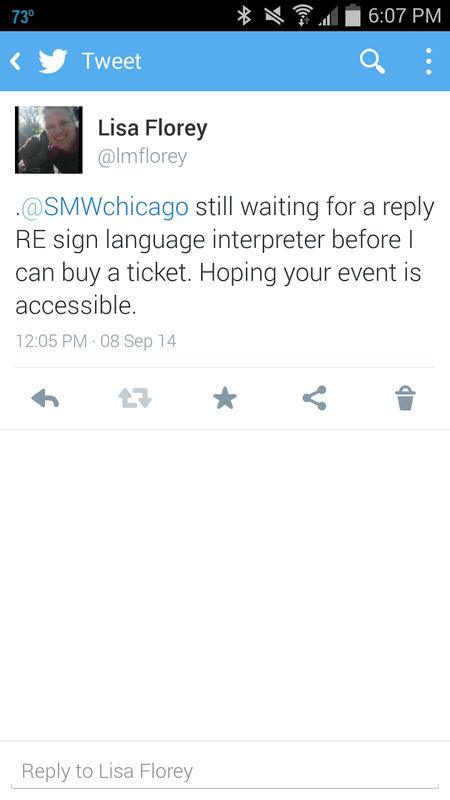 The next week, two weeks before the event, I tweeted their @SMWChicago handle asking for a reply about the sign language interpreter and the accessibility of their event. No response. By a social media event. An event sponsored by Microsoft, a company touted on their sponsor page as an "industry leader in accessibility innovation." Frustrating? Quite. I'm the social media chair of a nonprofit in the Chicago area and there were several classes that would have benefited me. I want to move into social media professionally; it's a great fit for me because it's a space where my disability does not matter one iota. I can move around and talk to people easily -- communication flows from the fingertips so much more fluently. I'm also an active Instagram user and would have liked to attend the Instagram Masterclass presented by several photographers I admire, including Nick Ulivieri and Jason Peterson. I'm good at reading lips and often surprise people with my skills. But attending a panel where three or four people would be talking -- sometimes in rapid succession? I'd be in way over my head. I write this blog not because I'm playing the "poor me" card, but because I refuse to let things like this get swept under the rug, and perhaps so situations like this can be avoided in the future. Education can be a powerful tool. And I'll repeat what I say every year as a Minnesota Vikings fan: Maybe next year.